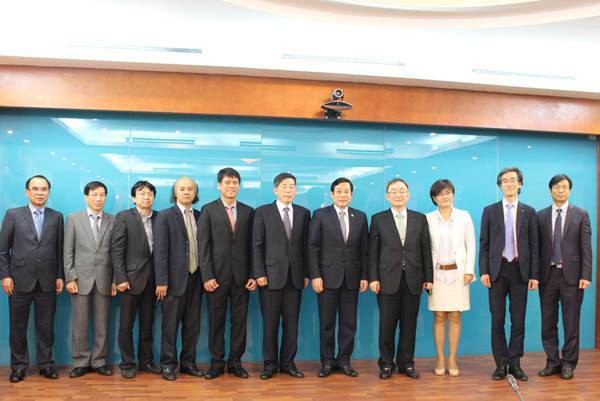 Last Friday, Vietnam’s Ministry of Information and communications and Korea Communication Commission (KCC) of South Korea agreed to a more comprehensive co-operation in the television field in Ha Noi. Both sides have agreed to sign a Memorandum of Understanding (MoU) within the first half of this year and inaugurate teams so as to strengthen and boost mutual cooperation ties. To boot, a new national education channel was also officially launched –VTV7. This being made possible with the assistance of Korean’s Educational Broadcasting System (EBS) to Vietnam television (VTV). Prior to this, both Vietnam and South Korea have worked together in the past to produce programmes and dramas as well as purchase copyrights for television shows. One such drama titled Tuoi Thanh Xuan (Forever Young) had already been produced from previous cooperation between VTV and a Korean partner. “Through the co-operation, the two countries would be able to share television programmes and produce them to export to other countries,” said Choi Sung-joon, KCC Chairman. The two leaders also discussed the development of television’s integration with the telecommunications sector. Co-operation in this sector would allow viewers to watch TV not only at home but also easily access them on smart devices regardless of time and location. In addition, both sides also discussed about boosting 4G co-operation. Vietnam plans to pilot and license 4G services this year. Successful piloting and coming to be able to provide 4G commercially are the Vietnam’s network provider strategic tasks this year. With respect to these plans, Korea has expressed their willingness to aid them to pilot the 4G technology and hoped that Vietnam would launch the service in the near future. The MoU is expected to induct a new stage of the bilateral cooperation in telecommunications, information and technology as well as media.